Citation Information: J Clin Invest. 2006;116(8):2105-2114. https://doi.org/10.1172/JCI27180. The CD18 hypomorphic (CD18hypo) PL/J mouse model clinically resembling human psoriasis is characterized by reduced expression of the common chain of β2 integrins (CD11/CD18) to only 2–16% of WT levels. Previously we found that this chronic psoriasiform skin inflammation also depends on the presence of CD4+ T cells. Herein we investigated the role of macrophages in this CD18hypo mouse model. Activated macrophages were significantly increased in lesional skin as well as in inflamed skin draining lymph nodes (DLNs) of affected CD18hypo mice and were identified as being an important source of TNF-α in vivo. Both depletion of macrophages and neutralization of TNF-α resulted in a significant alleviation of psoriasiform skin inflammation. As monocyte chemotactic protein 1 was enhanced in lesional skin of affected CD18hypo mice, we intradermally injected recombinant murine monocyte chemotactic protein-1 (rJE/MCP-1) alone or in combination with rTNF-α into the skin of healthy CD18hypo mice. Only simultaneous injection of rJE/MCP-1 and rTNF-α, but neither substance alone, resulted in the induction of psoriasiform skin inflammation around the injection sites with recruitment and activation of macrophages. Collectively, our data suggest that maintenance of psoriasiform skin inflammation critically depends on efficient recruitment and activation of macrophages with sufficient release of TNF-α. Increase in macrophages numbers in lesional skin and skin DLNs of affectedCD18hypo mice. (A and B) Skin cryosections from CD18WT (A) and affected CD18hypo mice (B) were stained with F4/80–Alexa 488 for infiltrating macrophages (green) into the skin. Cell nuclei (blue) were counterstained with DAPI. e, epidermis; d, dermis; h, hair follicle. Dotted lines indicate the border between epidermis and dermis. Original magnification, ×40; inset, ×100. (C) To quantify macrophages in the skin of affected CD18hypo and CD18WT mice, the positively stained cells were calculated. For all measurements, the median of macrophages counted in 12 high-power fields (HPF) is presented (n = 4). ##P < 0.0001, Student’s t test. (D and E) Immunostaining with macrophage/monocyte-FITC (clone MOMA-2) was performed on cryosections of skin DLNs from CD18WT (D) and affected CD18hypo mice (E). Infiltrated macrophages (green) were found in the medullar and subcapsular sinuses, as indicated by arrows. Cell nuclei (red) were counterstained with propidium iodide (PI). Original magnification, ×20. (F and G) To quantify macrophages in the skin DLNs of CD18WT (F) and affected CD18hypo mice (G), skin DLN cells were labeled with MOMA-2–FITC and analyzed by flow cytometry. Dotted line, isotype control; gray histogram, MOMA-2 staining. 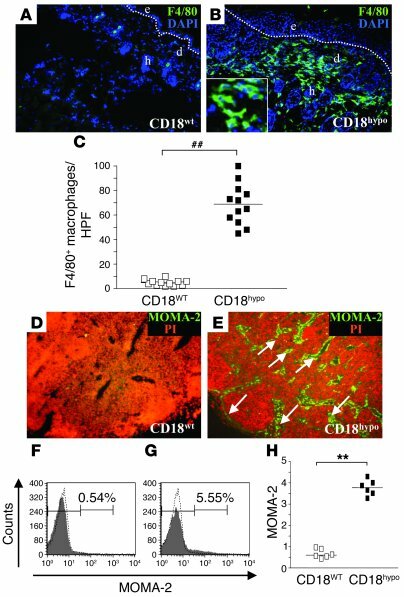 (H) Total number of macrophages in skin DLNs of CD18hypo and CD18WT mice (n = 6). One representative experiment of 3 is shown. **P < 0.01, Student’s t test.